Heat oven to 400°F. Separate dough into 10 biscuits. Separate each biscuit into 2 layers; place biscuit halves on large ungreased cookie sheet. Flatten each slightly. Cut artichoke hearts into 1/2-inch pieces. Brush top of each biscuit half with reserved artichoke liquid. 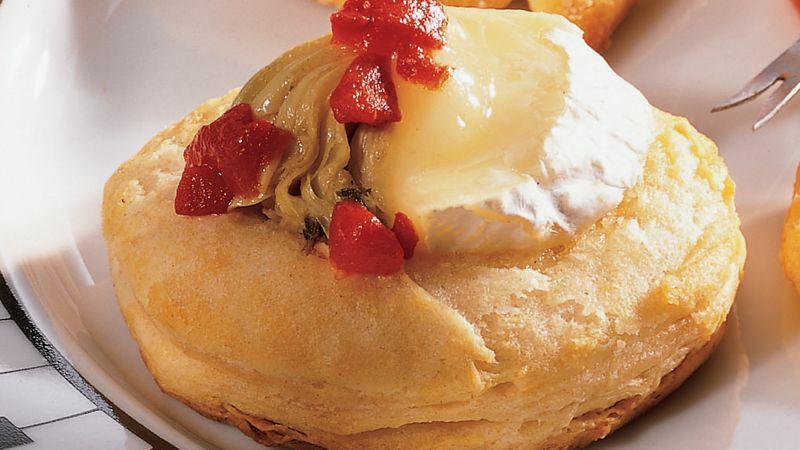 Divide artichoke pieces evenly on top of biscuits. Bake at 400°F. for 9 to 13 minutes or until edges of biscuits are golden brown. Meanwhile, cut cheese into 20 pieces. Remove cookie sheet from oven. Top each biscuit with piece of cheese. Return to oven; bake an additional 2 to 3 minutes or until cheese softens slightly. Garnish each with pimientos. Serve warm.